Schaum's Outline does a really good job in laying a solid grammatical foundation. By the end of it you will confident enough to have non-trivial conversations with French speakers. However, you will also realise that you have only scratched the surface, and that there is still a huge amount left to learn. In order to progress past this point, you need a broader resource. The French grammar bible. Period. No serious student of French should be without a copy of this authoritative grammar reference book. Covers virtually every topic you can think of, using fresh, interesting vocabulary to illustrate key points. Its structure layout allows students to master French grammar systematically. If Schaum's Outline was the tip of the grammar iceberg, this is the massive bulk floating under the water. It is difficult to convey how useful A Comprehensive French Grammar is for any student of French who wants to make real progress beyond the beginner’s level. This 700-page reference work is encyclopaedic in its breadth and depth: its topics include pronunciation, punctuation, noun formation, particles, diminutives, participles, gerunds, prepositions, word order, etc. Basically all of the rules – important and obscure – that you need to develop a robust grasp on how the language really works. The example sentences are all taken from real literary and non-literary French sources, and are a breath of fresh air from the typically boring constructions that language books normally rely on. Divided into 20 thematic topics, this book provides the reader with over 5,000 French words and their translations. Each topic is broken down into three levels, starting with the most basic words and building up to some quite advanced (and obscure) vocabulary. Engaging self-study tasks at the end of each section and etymological insights make this an enjoyable and productive learning resource. For those of you who have studied other languages, you may be familiar with Cambridge University Press’s excellent ‘Using X Vocabulary’ series. If not, you will have to take our word that this is an invaluable textbook, that will raise all aspects of your French proficiency. This is the solution. Using French Vocabulary is divided into 20 section (the natural world, industry, leisure & tourism, the physical body, etc. ), and each section is divided into three subsections. The first subsection contains basic vocabulary, whereas the last one will prepare you to authoritatively discuss the topic in question. At this point you may feel ready to take off the training wheels and start reading some French literature in the original. If that is the case, skip ahead to the next item on our list where we show you the best place to start with French classics. Seven short stories for intermediate Spanish learners, each one focused on a particular theme. Comes with quizzes, glossaries, and audio material of a native speaker reading out the stories. Seven short stories for intermediate French learners, each one focused on a particular theme. Comes with quizzes, glossaries, and audio material of a native speaker reading out the stories..
French Short Stories for Intermediate Level contains seven stories that each revolve around an everyday theme, for example: cooking, money, travelling, etc. This is obviously useful as the stories give you exposure to content that you will be using in real life. This could make for rather dull reading, but the author has done a great job in making the stories fun and interesting. Ten classic French short stories. Very challenging (only for confident upper-intermediate learners), but excellent practice. Extensive vocabulary support and cultural notes to gain a greater appreciation for French culture. Highly recommended for when you are ready. How can intermediate learners dip their toes into the choppy waters of French literature without feeling defeated after the first few pages? The answer is this wonderful book of classic French short stories. There’s no denying that the texts in this collection are difficult: only solid upper-intermediate learners should attempt them. That said, all of the short stories – ranging from Voltaire’s Micromégas to Camus’s L'Hôte have been handpicked for the very reason that they are both interesting and surmountable. The editors have done an excellent job in moulding a highly satisfying book for upper-intermediate learners that provides just the right level of exposure to France’s rich literary heritage without giving cause for any feelings of demoralisation. Excellent workbook that works well alongside Price’s grammar textbook. Crammed full of exercises to drill you on virtually everything you need to get your writing and speaking up to an advanced level. Price’s Grammar is such an intimidating brick of a book that it can be difficult to know where to begin with it. Because you now have so much information at your disposal you need an effective way to get it in your brain and keep it there. Annoyingly, Blackwell Publishing has not released a complementary workbook to go with the grammar as they did for other languages. Fortunately, the exercises found in Practising French Grammar cover almost exactly the same topics, and at the same level. It features over one hundred sets of writing tasks that involve all sorts of exercises: translation practice, sentence formation, etc. We should note here that Practising French Grammar is not suitable for lower intermediate learners. It is an advanced exercise book that tests you on some of the hardest aspects of French grammar, and as such only fairly advanced students will find it useful. Your writing boot camp: fortifies important grammatical topics with 500+ well-formulated exercises. All instructions and explanations are in French, so make sure you are comfortable with this before you buy. Versions for B1 and B2 CEFR levels available. You know that this is an exercise book aimed at serious intermediate students as soon as you open it – absolutely everything is in French! If you’re really not in a position to spend some time in a French-speaking country, the next best thing would be to find a language exchange partner in your home country. This means that many of the French speakers you will come across in your city will speak much better English than you speak French. It’s very difficult to get someone to suffer your broken French when they know they could accelerate the conversation by switching to English. Frustrating, but true! One way you can get around this is by making a semi-formal agreement with your interlocutor that you will speak English for half of the time, and French for the other half – that way you both get something out of it. Respectable online language courses like FrenchPod101, should still challenge you as you move up to intermediate level French. But now you should begin to spread your wings and start listening to real French conversations (i.e. not the watered-down French that teachers use). Thousands of high-quality podcasts for intermediate learners. Features a text on an interesting subject and then analyses its grammar and vocabulary. Over 2,800 podcast episodes already available. Reasonably priced. DailyFrenchPod is one of the best platforms for intermediate students to improve their French listening skills. Every day you get a new 5 to 10-minute podcast that tend to cover broad themes like current affairs, science, business, and politics. The host, Louis, then goes through the text and analyses each sentence, phrase by phrase, to make sure that you understand the vocabulary and grammar used in it. After this, the text is played back so you can have another go at understanding some of the subtler concepts. We really like this format – it’s an excellent way to attune your ear to faster, native-level speech that may involve idioms and figurative expressions. DailyFrenchPod isn’t free, but you get a seven-day free trial and the subscription isn’t particularly expensive. What’s more, as the platform’s been running for years, there is an enormous backlog of podcasts (~2,800) that can be accessed once you have subscribed. 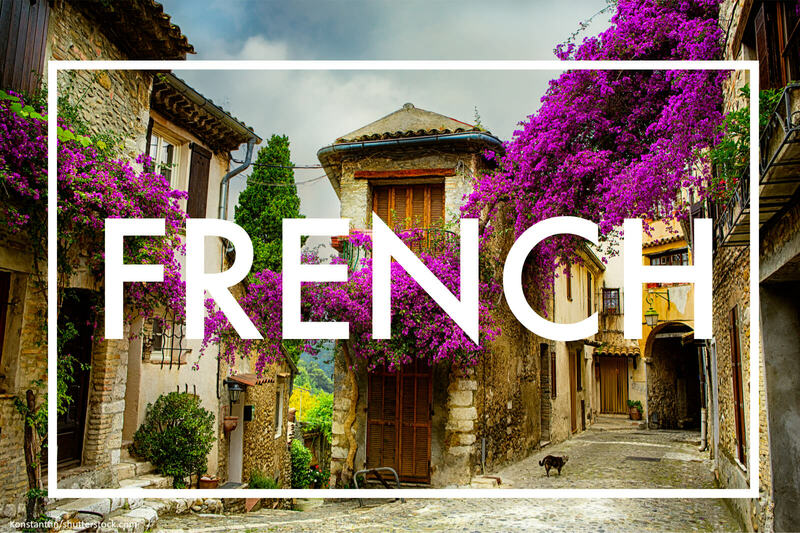 Like all good online language learning products, DailyFrenchPod comes with accompanying exercises and PDF transcripts. Teaches you the swear words that the French really use. Takes pains to lay out the grammar and context behind each word so you can use it correctly. Lots of examples given. Teaches you the swear words that the French really use. Takes pains to lay out the grammar and context behind each word so you can use it correctly. Lots of examples given.. If you want to learn how to swear in French, then you need this book. As the author rightly points out, the vast majority of swear words and colloquial words that you find in dictionaries are not actually used today and will sound bizarre if you – in your foreign accent, no less – go about using them. The book tells you which words to use and exactly how the French use them (with the correct grammar).